After the murder of their parents, 11-year-old twin brothers Thor and Rai Klein are sent away from their home planet. They find themselves awakening on the terraformed planet of Chimaera, where carnivorous plants dominate and the few humans who live there are divided into four groups known as "Rings." Soon after, they meet a young man by the name of Zagi, and the twins learn that only the "Jyu Oh Sei"—the one who conquers these four Rings—is allowed to leave the planet. Driven by the desire to return home and discover the truth behind the death of his parents, Thor resolves to survive in the harsh, merciless environment of Chimaera. However, he quickly learns there is more than meets the eye in this strange ecosystem. As Thor is swept up in the politics that entangle the Rings, he uncovers more about his parents' murder, and ultimately, humanity's fate as a whole. Jyu Oh Sei aired on Fuji Television's noitaminA block. Not very well known or popular, Jyu Oh Sei is a hidden gem. A relatively short anime, this series went way beyond my expectations in nearly all respects. Jyu Oh Sei dispels the myth that a series has to be long in order to be good. It's only 11 episodes but the plot moves very fast and a lot of stuff happens at a good pace. The story starts off with two twin brothers barely into their teens abandoned on a prison planet after their parents are killed. It begins as a &quot;survival tale&quot; with Thor, the elder brother, being the protagonist, and swiftly transitions into a nature documentary, action movie, drama and finally space opera. Secondary themes like genetics, social order, politics, relationships and existentialism are explored. You won't be bored. Real. Fascinating. Relateable. Even Machiavellian. Everyone has an agenda. Nobody is stupid. A few wear their hearts on their sleeves but they're all well fleshed out. Even those with relatively little screen time are important to the story. There aren't really any unnecessary characters. Even the plants in this show are their own characters. The animation is not as crisp in some places but overall quite good. When they say the main charater looks good, it's because he really does look good. The characters age and again this is very well done. Backgrounds are very detailed and realistic. Both the Opening and Ending themes fit the anime and were good songs in their own right. Sound effects were pretty good too. Overall very good. Extremely enjoyable. When it ended I wanted more. This could easily have been 24 or even 52 episodes. 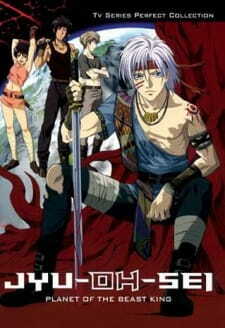 Completely underrated but very good, very watchable anime. It's hard to find though. Please PM me if you want it, I will figure out how to make a torrent for this if only to share this with other users. Jyu Oh Sei has stupid names for characters like Thor, Odin, and Zagi of Iliad, but if you can get past that ridiculous attempt at symbolism, and other miscellaneous missteps, you'll hopefully find yourself entertained by this fast paced epic adventure. On a colony planet far from Earth, two brothers stumble upon their murdered parents and are knocked out by gas. They wake up on a planet loaned from whoever built the sets for King Kong and Little Shop Of Horrors. That's right; the jungle tries to kill you every five minutes! Who killed their parents? Why were they sent to a cruel planet populated by miscreants in tribes who battle each other for supremacy? How can you get off a planet that's controlled in a dastardly manner that the agents of the Matrix would approve? More importantly, is this damn genre-juggling show worth a watch? Yes it is, and the reveal which propels the story into a completely different direction is excellent. What we get up to that is decent animation, pretty engaging world design and plotlines that sci-fi fans will dig, and that sense of epicness which comes along with a tale that follows a character over a period of years. With Jyu Oh Sei there's this feeling that you're watching something different from the norm, even though nothing about this production is pioneering in any way at all. I think this refreshing feeling has to do with the fact that the source of the story is from a short manga rather than one that went on endlessly, and that the production crew did a good job delivering it to the small screen. Maybe that in itself is rare these days? The bad guys in this show don&rsquo;t even have tiny irises! Kudos. There are miscellaneous flaws as mentioned above, like a love triangle that feels tacked on (aren&rsquo;t they all? ), generic narrative clich&eacute;s that you've seen a million times before and wish you'd never see again, but they're just little bumps in the road, nothing to dampen the parade. The core concept driving this show, that of the consequences of living in a dog-eat-dog world, fighting to survive for a tangible reason, and the relationship between you and your less-than-spectacular twin brother, are however compelling enough to make you forgive any clich&eacute;d moments that pop up. Jyu Oh Sei breezes along thanks to its 11 episode length; because it&rsquo;s a successful adaptation and not the insipid tailor-made trash of a TV writer. The soundtrack from the superb-as-always Hajime Mizoguchi is the final dressing on this dessert and stays with you long after you witness the last episode. Jyo Oh Sei is a good (maybe even great) 29 episode show squeezed into 11 episodes. The result isn't pretty. The foundation of the plot is a big 'ole mess of second rate science fiction concepts, including The Plant Planet, The Prison Planet, The War Between the Sexes, and others that it would be spoilerish of me to reveal. Seriously, this story kept reminding me of the Golden Age SciFi I've read. The difference is, those stories (well, the good ones anyways) fully explored their concepts and were able make interesting situations out of them. And perhaps the Jyu-Oh-Sei manga manages to do this, but here none of the concepts are really given enough time to become interesting. The setting and ideas have it easy, though. The characters are the ones who really suffer, as the creators push them through rushed plot twist after rushed plot twist. Perhaps the worst example comes in the first episode, when Thor whiplashes from protecting his brother, to trying to kill him, to protecting him again, in just a few minutes. What was supposed to be a brutal moral conundrum just comes off as silly (It doesn't help that his brother dies anyways in the same episode, essentially invalidating the whole moral struggle). And this show is talky. Very talky. There just isn't time for the characters to exhibit their traits through their actions, so everything has to be explained. This leads to some pretty significant disparities between how character talk, and their actions on the screen. No, this is not a character-driven anime. Rather, the plot is in control, cracking its whip and forcing the characters through one unnatural contortion after another. Still, despite all this, it manages to maintain a modicum of interest - up until Ninja Chick is introduced, in a forced attempt at a love triangle. Their is no chemistry to the relationship, however, and it only serves to dry up whatever enthusiasm the viewer has for the finale. The bizarre death of a major character at the end didn't even provoke more than a puzzled 'huh?' from me. Visually, the show is a mixed bag. The character designs and animation are pretty good, but they take place in incredibly uninspired locales. Big empty spaceships, big empty castles, big empty tundras, big empty valleys - there's just not much stuff on the planet of the Beast King, apparently. Another complaint is the misogyny present. Despite the fact that the original work was written by a woman, the story is far from feminist. Oh sure, on the surface stuff like "Women have the absolute right to choose their mates!" sounds all pro-Grrl, but the truth is that all our supposedly strong female characters are completely dependent on men by the end of the show (or dead). For all the vitriol, Jyu-Oh-Sei has redeeming qualities (it looks alright, the plot starts out somewhat intersting, etc), and people do like it. Nonetheless, this is simply not a very good show, and I recommend skipping it. Certainly don't blind buy it unless it's very cheap and you have a high tolerance for schlock. To start, the story. I've never imagined that kind of story could exist. Mixing Sci-fi with he...Hum...how to say it... with a &quot;king of the &quot;animals&quot;&quot;, was very sought. The beginning of the story was fast,so I realised very quick that all the anime will be like this. The only little problem is that the anime was just on 11 episodes, so some parties of the story couldn't be detailed. Like in the first ep', when Thor 's going to kill his twin, why don't we have some explanations about his feelings? And the part with Karim, it's a little bit disturbing when Thor fell in love so quick....It's just unbelievable. The animation and the art was very good, I really liked the battle scenes, even if the profile of the characters was special to me (the noses too, they were really ...special.and big.) . The sound , after that. So, the OP is special (lyrics, music and voice), but I enjoyed it, I just do not know why. the ED was absolutely beautiful for the voice, even if the lyrics weren't researched at all. The voices were all good, but in the last ep' I was disappointed: was it because it was the end that they were not looking passionate? The characters were good.But sometimes, I didn't understand why important characters ( the chiefs of the Cercles, for exemple.) didn't appear much longer, instead of some useless (Karim, Chen) chara' who were always in all the ep. By the way, the age of Thor was disturbing: His voice, and his physic didn't show us a vision of a nomal child of 11 for the first part, and a vision of an adolescent of 15.